To Cite: Abolhasan Gharehdaghi F, Shahverdi E, Niktoreh Mofrad N, Faranoush M, Ebadi A. Does a Single Dose of Adenosine in Epidural Space Reduce Cancer-Related Neuropathic Pain? A Randomized Clinical Trial, Int J Cancer Manag. 2018 ; 11(5):e61872. doi: 10.5812/ijcm.61872. Background: Systemic and intrathecal adenosine reduce chronic neuropathic and nociceptive pain; however, the effect of adenosine epidural injection in the treatment of neuropathic cancer-related pains remains unclear. Objectives: The objective of this study was to evaluate the efficacy of a single epidural administration of adenosine in alleviating chronic neuropathic pain in patients with primitive neuroectodermal tumors. Methods: In this single-blind randomized clinical trial with the unique ID of IRCT2017031428878N1, 88 patients with chronic neuropathic pain were divided into two equivalent groups. Two groups were treated with a single dose epidural administration of ropivacaine, 0.75 mL/kg from 0.2% solution (both groups), plus adenosine, 50 mcgr/kg (adenosine group), or normal saline (control group). Patients were evaluated on the days 1, 2, 3, 5, 7, 10, and 14 after injection. Results: Both groups showed a reduction in pain severity according to verbal rating scale (VRS) (3 ± 0.09-1 ± 0.05 in adenosine, 4 ± 0.08-1 ± 0.00 in the control group) and visual analogue scale (VAS) (7 ± 0.25-1 ± 0.12 in adenosine, 8 ± 0.22-1 ± 0.06 in the control group); however, this reduction was significantly higher in the control group (P < 0.0005). The intensity of neuropathic pain decreased in both groups according to Douleur Neuropathique 4 questions (DN4) scores (from 5 ± 0.23-1 ± 0.04 in adenosine group, and from 5.5 ± 0.24-1 ± 0.00 in the control group) without a significant difference between the groups (P = 0.19). Adenosine group had less nausea and vomiting (P < 0.0005).There was no significant difference in patient satisfaction levels between adenosine and control groups (P = 0.09). Conclusions: Administration of bolus epidural adenosine is not effective in reducing neuropathic pain in patients with primitive neuroectodermal tumors. Treatment of neuropathic pain, especially in patients with primitive neuroectodermal tumors (PNET), is one of the challenges in cancer pain management. This is generally a consequence of neuropathic pain’s chronic and severe nature, resistance to most of the current analgesics, and the possibility of association with allodia (touch-evoked pain) (1). It is shown that nerve compression and differentiation nerve injury can lead to pain in malignant disorders and also sympathetically mediated pain in a respective order (2, 3). The resistance of neuropathic pain to orthodox treatment options has drawn our attention to interventional methods (4). Moreover, many of the current guidelines for treatment of cancer-related pain, including WHO’s three-step analgesic ladder, have been recently modified according to this understanding (5). One agent, which is widely investigated as an alternative substitute for management of neuropathic pain, is adenosine. Adenosine is an endogenous purine nucleoside that modulates many physiological processes through 4 different receptor subtypes: A1, A2A, A2B, and A3. Cellular signaling of adenosine A1 receptors has a modulatory effect on pain transmission at spinal cord level (6). In addition, A1 agonists are used to treat atrial arrhythmias, angina, type II diabetes, and chronic pain. Adenosine receptors are abundant throughout the spinal column and previous studies have shown that neuropathic pain is usually accompanied by reducing levels of adenosine in the blood and cerebrospinal fluid (7, 8). According to these facts, this agent, hypothetically, can be used in the treatment of neuropathic pain by an epidural approach. The efficacy of systemic or intrathecal injection of adenosine has been the subject of a number of previous studies (9-11). Despite today’s knowledge about the efficacy of intrathecal and systemic administration of adenosine in the management of neuropathic pain, the assessment of its epidural injection outcomes remains limited to case reports. This study aims at determining the efficacy and applicability of single epidural injection of adenosine on reducing neuropathic pain. Before launching, this study was reviewed and approved by Mahak pediatric cancer treatment and research center’s ethics committee in Tehran, Iran and also was registered at the Iranian registry of clinical trials (IRCT) with the unique ID of IRCT2017031428878N1. A written consent form was obtained from all patients or parents/legal guardians of under-aged patients. From 121 admitted patients to MPCTRC pain clinic between 2013 and 2015, 88 eligible patients were selected according to inclusion and exclusion criteria. Inclusion criteria encompassed with the presence of chronic neuropathic pain diagnosed by Douleur Neuropathique 4 questions (DN4) neuropathic pain diagnostic questionnaire and failure to provide adequate pain relief with conventional treatments. Also the patients with the confirmed diagnosis of primitive neuroectodermal tumor (PNET), and patients between 12 and 22 years were excluded. The exclusion criteria in the study were the existence of extensive metastatic disease and withdrawal of the treatment. The patients with any of the following disorders were also excluded: second- or third-degree heart block (without a pacemaker), sick sinus syndrome (without a pacemaker), long QT syndrome, severe hypotension, decompensated heart failure, asthma, poison/drug-induced tachycardia, cauda equine syndrome, anticoagulation, coagulopathy, suspected local or systemic infection, hypovolemia, and any anatomical deformity interfering with the procedure. This study was designed as a single-blind randomized clinical trial. Randomization was performed with the use of the RANUNI function in statistical analysis system (SAS) software on the study website. The eligible 88 patients were randomly assigned into two groups: the adenosine group (n = 44) and the control group (n = 44). As an ethical consideration, all patients, regardless of the assigned groups, were treated with a basic analgesia with acetaminophen (30 mg/kg/day) and fentanyl (1 μg/kg/h) by patient-controlled intravenous analgesia (PCIA) throughout the study. On day 0, patients in adenosine group were treated with a single dose epidural injection of adenosine (50 mcg/kg) and ropivacaine (0.75 mL/kg from 0.2% Solution), and patients in the control group were treated with a single dose epidural injection of normal saline as placebo plus ropivacaine (0.75 mL/kg from 0.2% Solution). Epidural injections were administrated with the L5-S1 interspinous approach and injection volumes were equal in both groups. Adenosine used in this study was formulated as 5′-(4-Fluorosulfonylbenzoyl) adenosine hydrochloride (C17H16FN5O7S•HCl). An overview of the study design and procedures is presented in Figure 1. On days 1, 2, 3, 5, 7, 10, and 14 after injections, patient’s responses to treatments were evaluated. As a consequence of limitations in some of the neuropathic pain screening questionnaires, all of the evaluations throughout the study were performed by clinicians. On each evaluation day, pain assessment was performed by DN4 neuropathic pain diagnostic questionnaire, visual analogue scale (VAS), and verbal rating scale (VRS). Although the correlation of VAS and VRS has been approved by previous studies, the superiority of one method over another in the treatment of chronic cancer-related neuropathic pain, especially in children, is not established yet. Therefore, in order to homogenize the final scores of pain in quality and quantity, both VAS and VRS were used in evaluations (12-14). In addition, a complete history of adverse effects was recorded from patients on each evaluation day and patient satisfaction levels were assessed according to pain outcomes questionnaire-pain treatment satisfaction score (15). Figure 1. The flow-chart of the study design according to CONSORT 2010 flow diagram. 1) Intervention in adenosine group: single dose epidural administration of adenosine 50 mcg/kg + ropivacaine 0.75 mL/kg (0.2% solution), 2) intervention in control group: single dose epidural administration of saline + ropivacaine 0.75 mL/kg (0.2% solution), 3) follow-ups conducted on days 1, 2, 3, 5, 7, 10, and 14 after intervention in both groups. At each evaluation day, the efficacy of pain control was assessed by DN4 neuropathic pain diagnostic questionnaire, visual analogue scale (VAS), and verbal rating scale (VRS), in addition to frequency of complications and patient satisfaction levels. The demographic characteristics of patients and the results of evaluations by DN4 neuropathic pain diagnostic questionnaire, VRS, VAS, report of adverse effects, and patient satisfaction levels were gathered by checklists. The data were analyzed, using SPSS 22.0 (IBM Crop., Armonk, USA). The Chi-square test was used to compare nominal variables, t test for scale variables, and Mann-Whitney U test for ordinal data. Repeated measures ANOVA test was used for the comparison of two groups at the evaluation time points. P values less than 0.05 were considered significant for all of the statistical analyses. The data are reported as mean median ± SE (standard error of the mean) and frequency (percentage). The median age of patients was 16 ± 0.25 years with a range of 12 to 22 year. Male to female ratio was 1.9 (58/30) and 42 (50%) of patients had a positive history of at least one previous surgery. Before the intervention, the assessment of pain with DN4 questionnaire, VRS, and VAS showed the presence of moderate to high-intensity neuropathic pain in patients; median DN4 scores: 5 ± 0.16, median VRS scores: 3 ± 0.6, and median VAS scores: 7 ± 0.17. According to the pre-assessment analysis with Levene’s Test of Equality of Variances, at a P value more than 0.05, both adenosine and control groups were approved for homogeneity in demographic characteristics, the degree of nausea and vomiting, and pre-intervention pain assessment results (Table 1). Abbreviations: DN4, Douleur neuropathic 4 questions neuropathic pain diagnostic questionnaire 20; SD, standard deviation; VRS, verbal rating system; VAS, visual analogue system. aHomogeneity was evaluated according to Levene’s Test of equality of variances at P value > 0.05. Patient responses to treatment are described in Table 2. According to the results of Repeated Measures ANOVA tests on VAS and VRS scores, both groups showed a reduction of pain after the procedures; however, this effect was significantly higher in the control group (P < 0.0005). In addition, measures of DN4 questionnaire scores decreased throughout the study in both groups with no significant difference between them (P = 0.19). In both groups, DN4 questionnaire scores continued to decrease significantly until the evaluation day 7. At the evaluation day 7, these scores had reached their minimum and were stable as a plateau until the last day of evaluation, i.e. day 14.
aValues are expressed as median ± SE. bIntervention: epidural injection of adenosine + ropivacaine or saline + ropivacaine in each group. c1: without N/A, 2: N/A no need for drugs, 3: N/A need for drugs, 4: N/A unresponsive to drugs. dSatisfaction levels were assessed according to pain outcomes questionnaire-pain treatment satisfaction score25; 1: excellent, 2: good, 3: moderate, 4: weak, 5: dissatisfied. Patients in the adenosine group encountered a significantly lower number of experiences of nausea and vomiting (P < 0.0005) compared to the control group. Moreover, patient satisfaction levels significantly increased in both groups separately (P < 0.0005); however, there was no significant difference between adenosine and control groups (P = 0.09). The management of chronic pain, especially cancer-related chronic pain, is a challenge and usually needs a multimodal treatment approach (16). In addition, most of the current first-line treatments of neuropathic pain have modest alleviating potency at their best (17). There are several issues in management of cancer-related pain such as its neuropathic nature, its tendency to develop into a chronic condition, positive history of previous surgery, and psychological stress, which may cause difficulties in its management (18). These features certainly add to the importance of this issue and increase the need for finding novel therapeutic agents/procedures, such as adenosine, for management of chronic cancer-related neuropathic pain (19). Ferguson et al. showed that adenosine acts on pre- and post-synaptic receptors, which are pharmacologically indistinguishable (20). Belfrage et al. in a double-blind placebo-control crossover study showed that systemic administration of adenosine by the intravenous approach alleviates spontaneous neuropathic pain in patients. In another study, they demonstrated that intrathecal administration of adenosine is effective in reducing chronic neuropathic pain (21, 22). In a review by Hayashida et al. intravenous infusion of adenosine is reported to have significant potential for alleviating various types of pain, including neuropathic pain (15). Additionally, Sawynok stated that adenosine A1 receptors have less intense but considerable peripheral distribution on sensory afferent fibers (mainly c fibers), which are responsible for receiving and conducting pain stimuli (23). In addition, several previous clinical trials have demonstrated the alleviative potency of intrathecal adenosine injection (8). Eisenach et al. have also shown that intrathecal (but not systemic) administration of adenosine reduces allodynia in patients with neuropathic pain (10). While the evidence concerning the alleviating effect of intrathecal adenosine is fairly strong, there is not enough data available regarding the presence/distribution of adenosine receptors in epidural space or the effect of its agonists’ epidural injection. However, the obtained results of the current study determined that treatment with a single-dose epidural injection of adenosine with ropivacaine has no significant superiority over ropivacaine alone. This finding may have resulted from our limited understanding regarding the distribution of adenosine receptors through the epidural space and intricate anatomical features of this area. In the first place, the current literature is not decisive about the presence of adenosine receptors in epidural space. In the second place, epidural space’s lack of integrity and its sporadic fatty tissue may have restricted the uptake of adenosine (24). In addition, there are several issues, which should be addressed in future studies. First of all, another pharmaceutical formulation of adenosine (other than adenosine hydrochloride salt, which was used in this study) may have stronger effect; therefore, this possibility should be the topic of future research projects. Moreover, a study, which investigates the effect of a selective adenosine agonist alleviating chronic cancer-related neuropathic pain, should be conducted in the future. Other than the formulation, another issue, which needs to be evaluated, is whether or not there is a need for developing a long-acting formulation of this agent in order to achieve better results. The systemic administration of adenosine may induce nausea and vomiting as a consequence of adenosine-related vasodilation and eventually hypotension (9). In contrast, previous case report by Gharehdaghi et al. has suggested that an epidural administration of adenosine was accompanied by a reduction in patient’s nausea and vomiting level (25). According to the results of the current study, treatment with epidural adenosine and ropivacaine significantly reduce nausea and vomiting compared to treatment with epidural ropivacaine alone. These results suggest that adenosine may be used as an adjunct to ropivacaine in order to reduce treatment-induced nausea and vomiting; however, the superiority of this agent over using current safer orthodox anti-nausea and vomiting treatments should be further investigated. Yamaoka et al. in a more recent study showed that the administration of intrathecal adenosine effectively inhibits the pain signals in patients with neuropathic pain (26). Small sample size, short follow-up periods, and single-blinded study design are the limitations of the current study, which have adversely affected the generalizability of outcomes. Moreover, ethical considerations have prevented the authors from designating a control group with pure placebo pain control. This issue has limited our judgment of adenosine potency in the management of neuropathic pain according to the obtained results. In conclusion, the administration of bolus epidural adenosine does not have an adequate alleviating effect on chronic neuropathic pain in patients with PNET. However, the addition of adenosine to epidural ropivacaine shows a significant superiority in reducing nausea and vomiting in patients. The clinical applicability of this issue, however, should be studied further in the setting of clinical trials. Mahak’s research team sends their gratitude to all colleagues for their helpful discussions. Authors’ Contribution: All authors contributed equally in study design, data collection, analysis, interpretation of data, writing the report, and in the decision to submit the paper for publication. Financial disclosure: There are no funding sources. Mahak pediatric cancer treatment and research center supported the results reported in the article and also the datasets used and/or analyzed during the current study are available by the corresponding author on reasonable request. 1. Zhang C, Zhang J, Wang G, Xu J, Li Y, Guo Q, et al. Benefit of Sunitinib in the treatment of pulmonary primitive neuroectodermal tumors: a case report and literature review. Oncotarget. 2016;7(52):87543-51. doi: 10.18632/oncotarget.13896. [PubMed: 27974690]. [PubMed Central: PMC5350009]. 2. Thönnes S, Sorg H, Hauser J, Tilkorn DJ. Localized eosinophilic fasciitis (Shulman’s disease) as a differential diagnosis of nerve compression syndrome. InnovatSurg Sci. 2017;2(1):23-5. doi: 10.1515/iss-2016-0203. 3. Jensen TS, Gottrup H, Sindrup SH, Bach FW. The clinical picture of neuropathic pain. Eur J Pharmacol. 2001;429(1-3):1-11. [PubMed: 11698022]. 4. Raphael J, Hester J, Ahmedzai S, Barrie J, Farqhuar-Smith P, Williams J, et al. Cancer pain: part 2: physical, interventional and complimentary therapies; management in the community; acute, treatment-related and complex cancer pain: a perspective from the British Pain Society endorsed by the UK Association of Palliative Medicine and the Royal College of General Practitioners. Pain Med. 2010;11(6):872-96. doi: 10.1111/j.1526-4637.2010.00841.x. [PubMed: 20456069]. 5. World Health Organization. WHO's cancer pain ladder for adults. 2014. 6. Johansson B, Halldner L, Dunwiddie TV, Masino SA, Poelchen W, Gimenez-Llort L, et al. Hyperalgesia, anxiety, and decreased hypoxic neuroprotection in mice lacking the adenosine A1 receptor. Proc Natl Acad Sci U S A. 2001;98(16):9407-12. doi: 10.1073/pnas.161292398. [PubMed: 11470917]. [PubMed Central: PMC55434]. 7. Durante M, Squillace S, Stockstill K, Wahlman C, Masini E, Tosh D, et al. (193) Contribution of IL-10 and T cells in beneficial effects exerted by A 3 adenosine receptor agonists in blocking and reversing neuropathic pain. J Pain. 2017;18(4). S24. doi: 10.1016/j.jpain.2017.02.100. 8. Nascimento FP, Macedo Jr SJ, Santos AR. The involvement of purinergic system in pain: adenosine receptors and inosine as pharmacological tools in future treatments. InTech; 2012. 9. 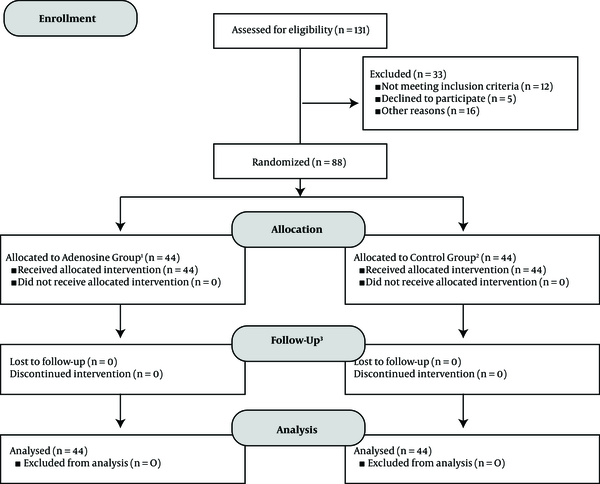 Jin X, Mi W. Adenosine for postoperative analgesia: A systematic review and meta-analysis. PLoS One. 2017;12(3). e0173518. doi: 10.1371/journal.pone.0173518. [PubMed: 28333936]. [PubMed Central: PMC5363816]. 10. Eisenach JC, Rauck RL, Curry R. Intrathecal, but not intravenous adenosine reduces allodynia in patients with neuropathic pain. Pain. 2003;105(1-2):65-70. [PubMed: 14499421]. 11. Zhang Y, Conklin DR, Li X, Eisenach JC. Intrathecal morphine reduces allodynia after peripheral nerve injury in rats via activation of a spinal A1 adenosine receptor. Anesthesiology. 2005;102(2):416-20. [PubMed: 15681960]. 12. Kliger M, Stahl S, Haddad M, Suzan E, Adler R, Eisenberg E. Measuring the Intensity of Chronic Pain: Are the Visual Analogue Scale and the Verbal Rating Scale Interchangeable? Pain Pract. 2015;15(6):538-47. doi: 10.1111/papr.12216. [PubMed: 24735056]. 13. Lee JJ, Lee MK, Kim JE, Kim HZ, Park SH, Tae JH, et al. Pain relief scale is more highly correlated with numerical rating scale than with visual analogue scale in chronic pain patients. Pain Physician. 2015;18(2):E195-200. [PubMed: 25794219]. 14. Boonstra AM, Schiphorst Preuper HR, Balk GA, Stewart RE. Cut-off points for mild, moderate, and severe pain on the visual analogue scale for pain in patients with chronic musculoskeletal pain. Pain. 2014;155(12):2545-50. doi: 10.1016/j.pain.2014.09.014. [PubMed: 25239073]. 15. Hayashida M, Fukuda K, Fukunaga A. Clinical application of adenosine and ATP for pain control. J Anesth. 2005;19(3):225-35. doi: 10.1007/s00540-005-0310-8. [PubMed: 16032451]. 16. Ablin JN, Buskila D. "Real-life" treatment of chronic pain: Targets and goals. Best Pract Res Clin Rheumatol. 2015;29(1):111-9. doi: 10.1016/j.berh.2015.04.020. [PubMed: 26267005]. 17. Gilron I, Baron R, Jensen T. Neuropathic pain: principles of diagnosis and treatment. Mayo Clinic Proceedings. Elsevier; 2015. 18. Afsharimani B, Kindl K, Good P, Hardy J. Pharmacological options for the management of refractory cancer pain-what is the evidence? Support Care Cancer. 2015;23(5):1473-81. doi: 10.1007/s00520-015-2678-9. [PubMed: 25749509]. 19. Schug SA, Chandrasena C. Pain management of the cancer patient. Expert Opin Pharmacother. 2015;16(1):5-15. doi: 10.1517/14656566.2015.980723. [PubMed: 25479712]. 20. Thompson SM, Haas HL, Gahwiler BH. Comparison of the actions of adenosine at pre- and postsynaptic receptors in the rat hippocampus in vitro. J Physiol. 1992;451:347-63. [PubMed: 1403815]. [PubMed Central: PMC1176165]. 21. Belfrage M, Sollevi A, Segerdahl M, Sjolund KF, Hansson P. Systemic adenosine infusion alleviates spontaneous and stimulus evoked pain in patients with peripheral neuropathic pain. Anesth Analg. 1995;81(4):713-7. [PubMed: 7573999]. 22. Belfrage M, Segerdahl M, Arner S, Sollevi A. The safety and efficacy of intrathecal adenosine in patients with chronic neuropathic pain. Anesth Analg. 1999;89(1):136-42. [PubMed: 10389791]. 23. Sawynok J. Adenosine and ATP receptors. Analgesia. Springer; 2006. 24. Fyneface-Ogan S. Anatomy and clinical importance of the epidural space. Epidural Analgesia-Current Views and Approaches. InTech; 2012. 25. Gharehdaghi A, Tashvighi M, Mehrvar A. Analgesic Effect of a Single Dose of Adenosine for Neuropathic Pain Reduction in a Patient with Primitive Neuroechtodermal Tumor. IJBC. 2011;6(4):215-9. 26. Yamaoka G, Horiuchi H, Morino T, Miura H, Ogata T. Different analgesic effects of adenosine between postoperative and neuropathic pain. J Orthop Sci. 2013;18(1):130-6. doi: 10.1007/s00776-012-0302-0. [PubMed: 22996813]. [PubMed Central: PMC3553403].